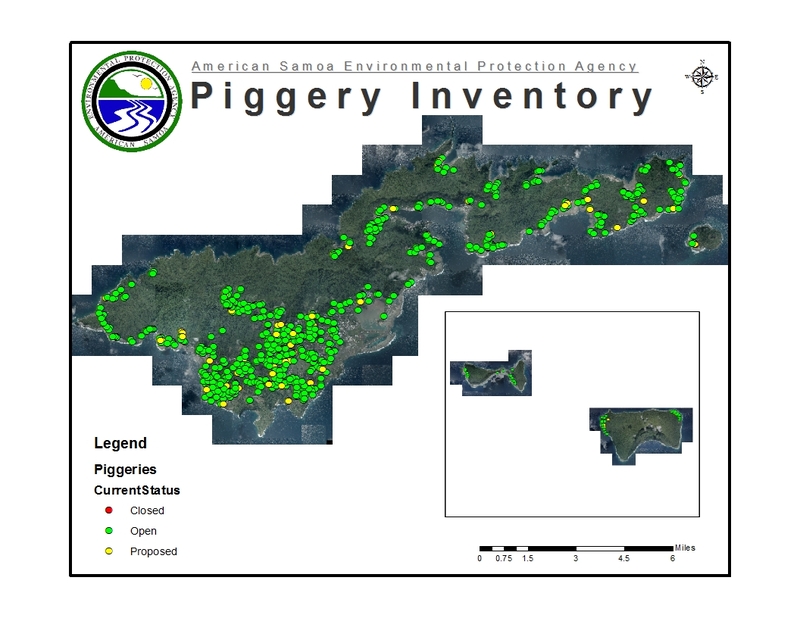 The objective of the AS-EPA Piggery Compliance Program is to protect human health and the environment by enforcing compliance for piggeries. To meet the objective, the Branch regulates and enforces compliance through a concerted program of educational outreach, inspections, warnings, citations, and follow-up. Implementation of this program will result in direct improvements to surface water quality, and subsequently reduce the incidence of leptospirosis and other diseases. A collateral benefit will be improved quality of life in crowded villages. The AS-EPA piggery Compliance Program has approved a variety of alternative piggery designs that include the Dry Litter Piggery and Wash Down Piggery. Because pigs generate a large quantity of high-strength effluent that overloads traditional septic systems, all of these designs include composting as a pig waste management technique. It minimizes contact between pig waste and water, which reduces the public health and environmental hazards associated with pig waste contamination in our water. It is a dry process, which reduces odors and wards off vermin such as flies and roaches that carry disease. It kills pathogens that are found in pig waste. Compost can be used as a fertilizer for plants. A Wash Down piggery uses water to clean the pens daily.The waste management system is comprised of a solid waste separator that filters out solid waste for composting.Liquid wastewater then enters an appropriately sized septic tank and drain field for proper disposal. Solids are placed in compost bins and mixed with dry material. Farmers are encouraged to visit a demonstration of this facility at ASCC Land Grant.